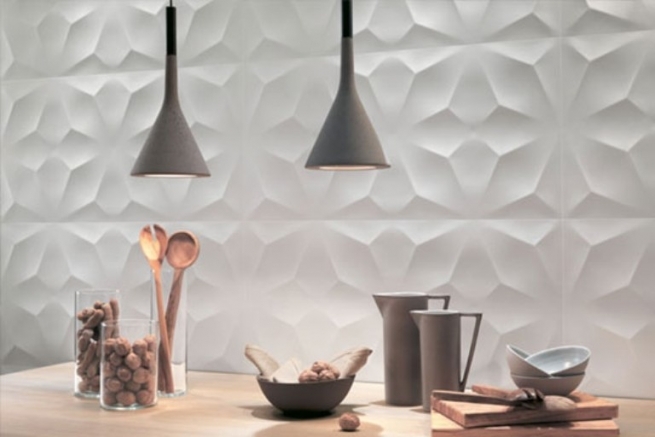 Reminiscent of ancient european bas relief, sculptured tile brings elegance and style to any living or work space. Also known as “3D tile”, these products are not your typical flat gloss glazed or simple stone textured tiles. Instead, the body of the 3D tile has a deeply registered texture that creates a stunning visual of depth, dimension, and movement. 3D tile is most often seen in neutral colors as to give the bold texture an understated look. However, many colorful decorative glazes are also available for a more dynamic design. Additionally, directional white or colored lighting can be added to the space to play up the pattern and create added dimension for a truly custom look. Popular uses for this fun design trend are backsplashes, accent walls, fireplaces, bath walls, and built-ins. However, the decorative nature of this tile makes it suitable for wall installation only. Visit an Area Floors showroom to see and feel these amazing products for yourself. 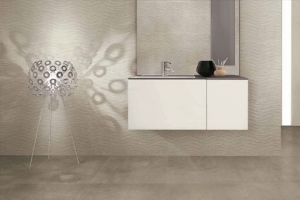 One of our expert staff will be happy to assist you in bringing this artistic tile trend into your home or office.